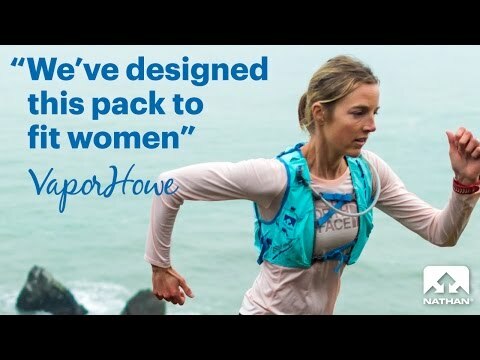 VaporHowe 4L Women's Race Vest is rated 4.3 out of 5 by 25. Rated 5 out of 5 by Regan R. from AWESOME! I purchased this vest after reading several reviews suggesting this was the one to purchase. I did not try one on in a store prior to ordering, and found that it fits true to size if you measure correctly. As far as running in it, it is a dream. The material is more comfortable than I imagined; there is no chafing and very minimal bouncing. The pockets have more than enough room to carry things I needed for a 25k trail run and I didn't find the bottles too hard to re-fill, though one of them does thread rather difficult. I would highly recommend this vest for anyone looking for a comfortable hydration vest. Rated 5 out of 5 by Cynthia Schauer from Great vest, terrible flask design I love this vest. I cram mine full -water bottles because the flasks are impossible, GoPro, Gels, phone. Even crammed full, the vest still feels weighless. The flasks are tragic. A good 5 minutes to carefully screw the top back on and they still leak. I use regular water bottles instead. I wanted to love them but ended up throwing them across the parking lot during a race. (Don't worry I picked them up lol). Rated 5 out of 5 by Annie from Great for smaller build I have a fairly small torso (I wear an XS in backpacking backpacks) and was so happy to find this race vest after trying out a number of options that all just fit too loose. The bottles and front pockets are great, and I love that there's space for a bladder for longer runs. I wish there was a phone-sized pocket on the front, but otherwise love the vest. Also, I recently lost one of the bite valves for one of the bottles, and was sent a new one at no cost, no questions asked. Some of the best customer service I've for this kind of situation! Rated 4 out of 5 by Mustang S. from Great Vest I have both the 4L and the 12L, both are great, I like the soft flasks (no problems with leaks) and the side pockets that are not on the 12L, but like the zipper pocket on the back of the 12L. Also like the lower position of the bottle pockets on both vests and the snug comfortable fit of the material used in both. The bladder on the 12L is quite unique and gives flexibility to go long. No complaints only suggestion would a place for my car key, key clip somewhere would be great. Rated 3 out of 5 by Trailrunner11 from Comfortable up to a certain point I am a 5ft 105 lb marathoner/ultrarunner and I bought this vest to replace my VaporAiress for an upcoming 100 miler. I trained with it for a few months and loved the fabric and the flasks with extended straw. However, during my 100miler, the hard material used for the stitching started digging into my ribs. By mile 55 I had to exchange it for the VaporAiress, but by then it was too late and my ribs were bruised. I thought maybe it was because there was too much in the front pockets so I decided to try it again at a 40 mile race a few weeks later and the same thing happened again. I really wanted to love this vest, but the hard stitching on the outer lining just bothers my ribs. The stiching on the VaporAiress is not hard like that. I would love the Vapor Howe is the lining was more like the VaporAiress. Rated 4 out of 5 by Runner from Nice vest, with some flaws After reading reviews, ordered one size up, and it fits well. The main vest inside material in the back and front is not stretchy, so it does not bounce overall. The pockets sewn onto that material are stretchy, and so accommodate adding items well. Overall, soft and no chafing issues; nicely designed. Two drawbacks: 1. The main non-stretchy material is thick and does not breath at all. It has holes in it, which allows some breathing. But this is not a vest for running in the muggy south (one place that I run). 2. The front straps are slippery and slip to full open rapidly (within 1/4 mile). I either tie mine or use a safety pin, which works well, but makes it hard to adjust on-the-run. So overall, a great vest for dry or cool climates; ok for training in muggy & warm areas, but would not use for racing there; the slippery front straps are flaw that range from minor to very irritating, depending on whether you need to make an adjustment. Rated 5 out of 5 by carol67 from My favorite vest! I purchased this vest a couple of months ago. I absolutely love it. I have tried several different vests before I finally tried this one. I like the way it fits, more like a shirt than a vest. I don't even notice I have it on, there is zero bounce. I wore this in a 50 mile ultra, in June, in the south. It didn't cause me to overheat or cause any chafing. I also really like the soft flasks in this vest. They slide in and out of the pockets easily and the vest has loops to keep the straws from bouncing around.